The Binson Echorec is one of the most revered vintage echo units and the Boonar promises to capture its magic in a stompbox format. Many vintage echo effects were great sounding units, so long as you had the expertise, budget and patience to keep them running. They were also bulky, required mains power and ‘true bypass’ was never an option. As the years rolled by, some players stuck to their beloved antique echos, preferring character to the sterile convenience of early digital devices. Others gleefully abandoned their Space Echos, Echoplexes and Binson Echorecs during the 1980s… only to regret it later. In the guitar world, cutting edge digital technology is increasingly directed towards recreating the tone, foibles and technical ‘shortcomings’ of vintage gear. Better still, talented designers are melding digital processing with analogue signal paths that are similar or even identical to the original units. Croatian firm Dawner Prince is one of these companies, and the Boonar is essentially a Binson in a BB box. On the outside, designer Zoran Kraljevic recreated the Binson’s black and gold colour scheme, while on the inside FETs replace the valves and DSP replaces the spinning magnetic drum. 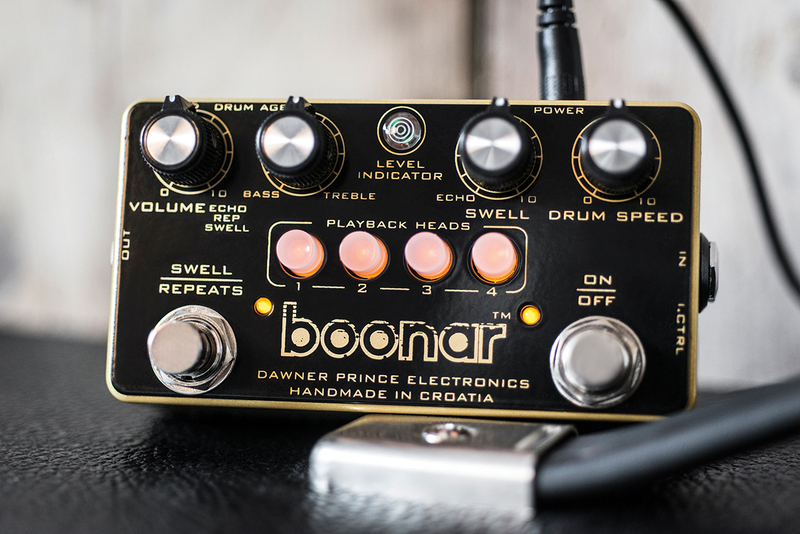 Although compact, the Boonar has controls for virtually every parameter and four ‘playback head’ buttons replace the Binson’s original rotary switch. This provides the Boonar with up to 16 head combinations compared to the Binson’s 12. Accessible through holes in the chassis, there are also ‘hidden’ controls for drum age and input level. You can use the trimmers to set and forget or utilise the mini controls provided for easy access. Inside, a third trim pot sets the dry signal level and dip switches provide tails/true bypass and original/modern input impedance options. The swell/repeats footswitch requires explanation. Repeats mode is the standard setting and it provides repetitions determined by how the swell control is set. Swell mode introduces a portion of signal from all four playback heads into the Boonar’s output bus to create a dense and echoing reverb type effect. Select the first head, turn the swell and drum speed up high and, rather than echo, you get a very fine roomy reverb effect with a slow and subtle pitch shift on the decay. Hitting the swell/repeats switch intensifies and deepens the effect to create the illusion of an even bigger space. Take the speed down to half way, deactivate the swell/repeat switch and minimise swell to enter slapback city. Even with a single repeat, the Boonar somehow makes a guitar sound more 3D and lively. Compared to a Catalinbread Belle Epoch in slapback mode, the Boonar is clearer and brighter with more shimmer but less thickness and drive in the mids. When used individually the playback heads should just alter the delay time range of the drum speed. Although we wouldn’t swear to it, it does seem as if each head has a slightly different voicing. The fun really starts when you begin using the heads in combination, and the possibilities here seem endless. With high swell settings selected, the Boonar takes a trip towards ambient psychedelia. Set the volume and bass/treble just right and you can get harmonious and breathy pad effects under picked arpeggios and held chords. Even switch clicks and finger scrapes spin off into wild atmospherics. Back off the swell and brighten up the tone in order to make the echoes become more precisely defined, and you are soon lost in complex rhythmic patterns, as the Boonar virtually plays along with you. The removable input and drum age trimmer controls are a stroke of genius. Both of these can edge the Boonar into lo-fi loveliness as cranking the input adds a hint of fuzzy breakup and ‘ageing’ the drum morphs the tone from a glistening shimmer into a darker and thicker soup where the modulation effect becomes more apparent. In tails mode the ‘bypass’ tone is noticeably coloured. 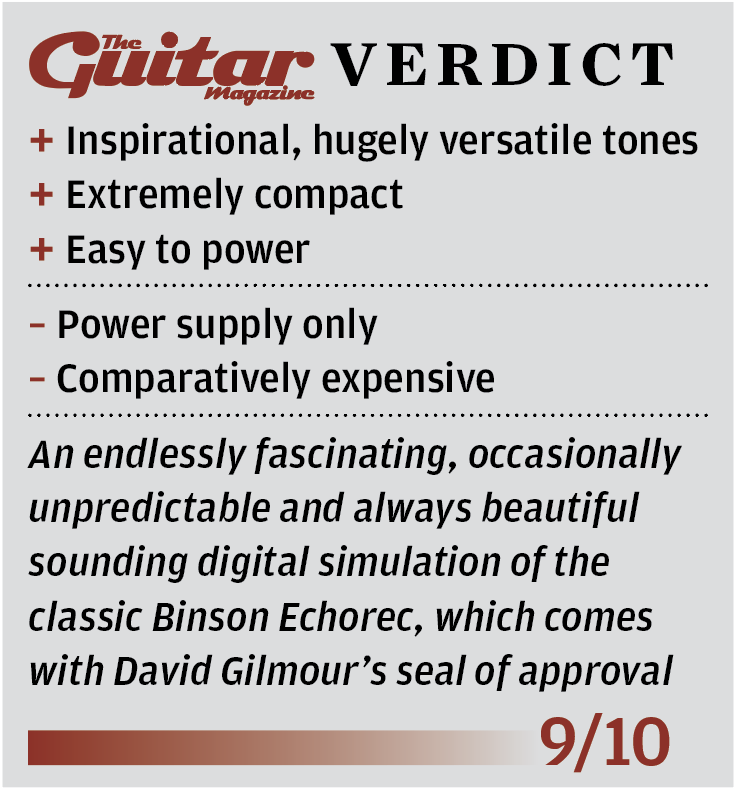 The Boonar imparts a glassy bite to the upper mids and a percussive thwack that anybody familiar with David Gilmour’s earlier recordings will instantly recognise. Tails mode enhances cut, clarity and detail while adding a hint of compression. We are not convinced that the true bypass mode is quite what it purports to be, and the original/modern dip switch is the giveaway here. Essentially it sets input impedance, toggling between the vintage-correct 47K and a contemporary 1M. Original mode is darker and warmer while modern is brighter and seemingly louder, and the contrast is apparent even when the Boonar is switched off with the true bypass mode selected. The modern mode actually sounds closest to the sound of the guitar plugged directly into an amp, but when the effect is activated, this situation is somewhat reversed. Original mode might be described as a deliberate impedance mismatch, and it’s a feature common to vintage Roland Space Echos. All echo pedals generate repeats of the input signal so, in theory, they should sound much the same. Instead they are characterised by their tonal colouration and the way they feel to play. Some may seem to fight against you and clutter up proceedings while others gel seamlessly with your playing to provide a distinct effect without getting in the way. The Boonar most definitely falls into the second category because, irrespective of drum speed or head selection, it always manages to groove along nicely and the tonal enhancement is undeniable. We are particularly impressed with the modulation. Many digital pedals that are designed to emulate analogue echos also feature modulation, but it’s often too regular and exaggerated to be entirely convincing. 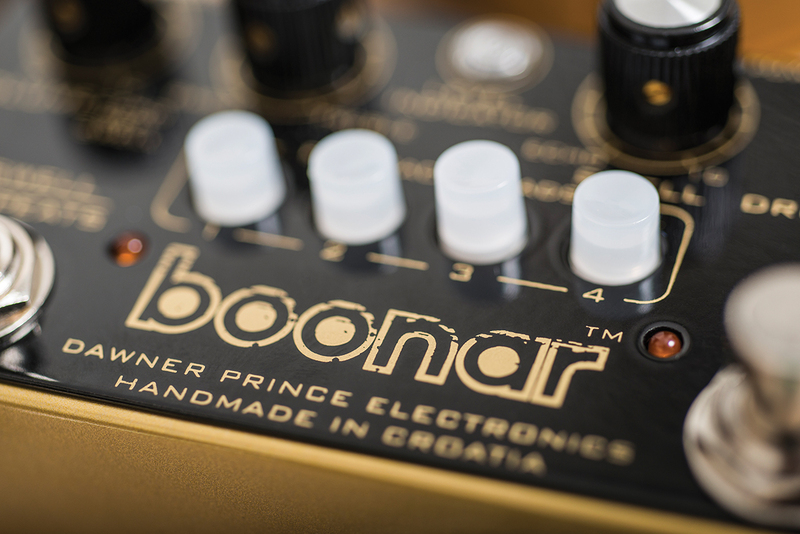 Not so the Boonar – it sounds so natural and musical, and is very much in the spirit of a classic Echorec unit. This is a retro-flavoured do-it-all echo pedal with a fantastic set of features and one very important distinguishing characteristic – it makes even the mundane sound beautiful. The question is, would an echo aficionado such as David Gilmour actually use one? Well, yes, actually – the Floyd legend has one on his pedalboard, as does John Mayer. What further endorsement do you need?